The Jeweled Heart Lock is a stylish addition, with light pink Swarovski crystal detailed in the shape of a heart. Discover all the ways to express yourself with one of a kind jewellery that reflects your life and experience. Chamilia jewellery is as unique as you are. MADE WITH SWAROVSKI ELEMENTS. SWAROVSKI is a registered trademark. 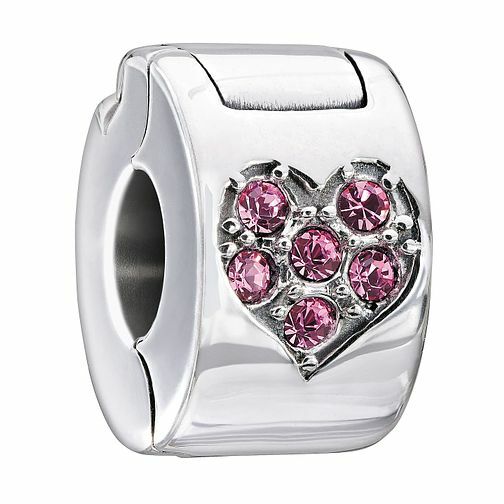 Chamilia heart lock with pink Swarovski crystal is rated 5.0 out of 5 by 2. Rated 5 out of 5 by Anonymous from Lovely Lock Bead This Lock Bead is absolutely stunning and will set of any Camilia Bracelet Perfectly.